What a great day to be an EAGLE! Emma Bawinkel is going to state in Girls Golf. We are so proud of all of our lady golfers. 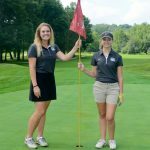 Brown County High School had the privilege of honoring our two senior golfers on Wednesday, September 14 at Salt Creek Golf Course. We have thoroughly enjoyed having Tori Akles and Emma Bawinkel represent Brown County High School!